We love the idea of meal prepping a week’s worth of mason jar salads because they’re quick to make, packed with nutrients, and a great way to get in your veggies. But with cold weather blowing in, sitting down to a cold salad doesn’t really sound that appealing. 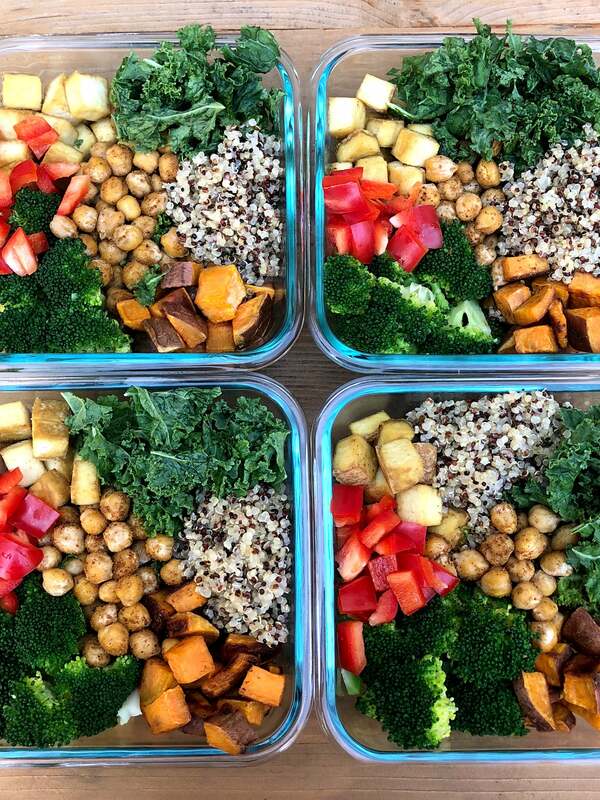 You’re gonna want to skip the raw veggies and make these Winter-inspired Buddha bowls instead. Hearty and satisfying with so many textures and flavors, these Buddha bowls come together in one hour. 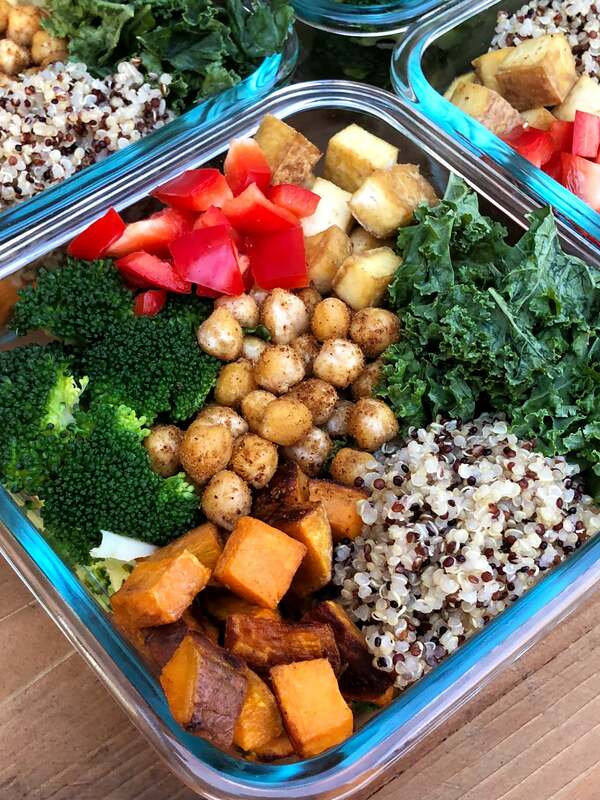 Your taste buds will delight in roasted sweet potatoes, baked tofu, sautéed spiced chickpeas, steamed broccoli, red peppers, kale, and quinoa. 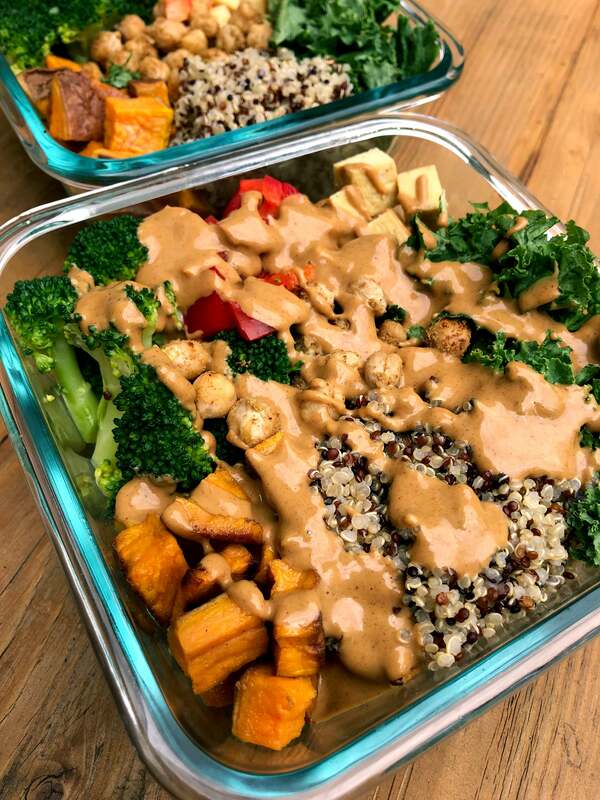 Topped with an easy-to-make creamy peanut sauce, lunch is going to be so awesome! This recipe makes enough ingredients to create four large, 527-calorie bowls of yumminess, offering almost 30 grams of protein and 10.2 grams of fiber. Since I do intermittent fasting and don’t eat until noon, this larger bowl is exactly what I crave. 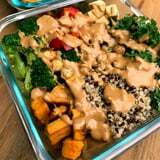 Or you can make five smaller, 422-calorie bowls, offering 23.4 grams of protein and more than eight grams of fiber. 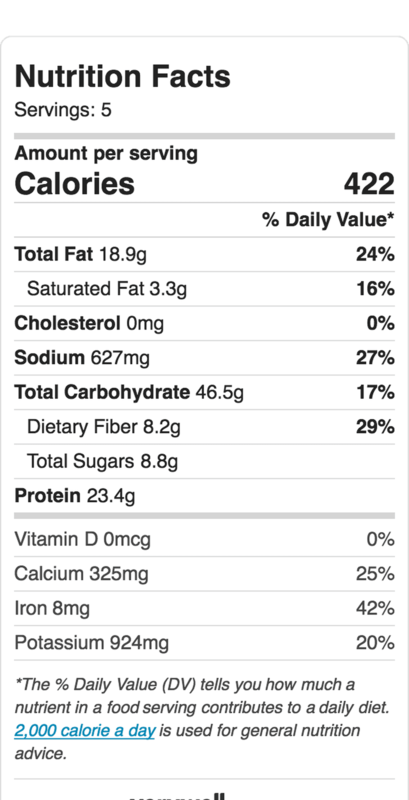 Your protein, healthy fats, carbs, and fiber are all covered, and you’ll feel satisfied and energized for hours. 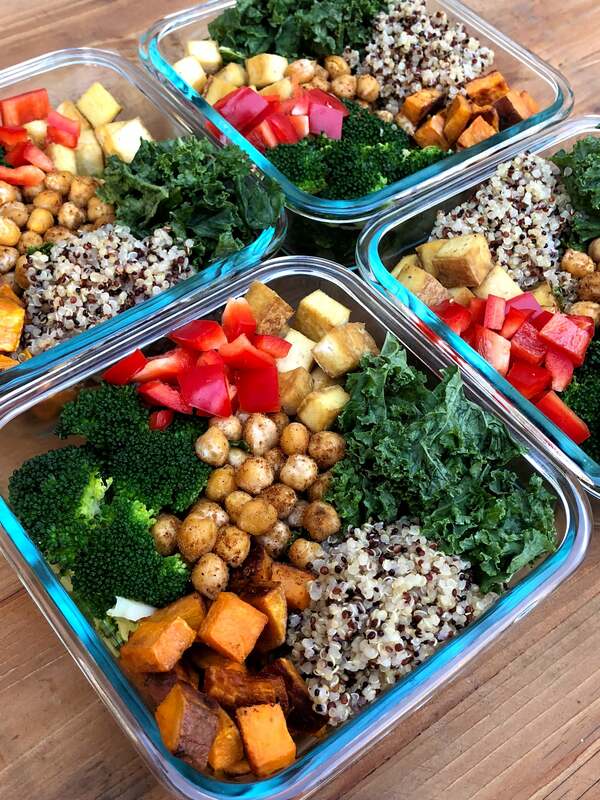 Just prepare the sweet potatoes, tofu, chickpeas, broccoli, red peppers, kale, and quinoa, grab four (or five) glass containers, and have fun assembling your bowls. They’ll keep fresh for up to five days in the fridge. Make the peanut sauce and store it in four little containers. At lunchtime, drizzle the sauce on top; warm it up for one to two minutes in the microwave or enjoy it cold – both taste amazing! Place sweet potatoes on one side of a cookie sheet and toss with olive oil and salt. Add cubed tofu to the other side and toss with olive oil, garlic powder, and salt. Roast for 20 minutes. Stir sweet potato, then tofu, and roast for another 10 minutes. While that’s roasting, add uncooked quinoa and water to a covered saucepan on high heat. Once it comes to a boil, lower heat to simmer and cook for 20 minutes. Fluff with a fork and set aside. Add chickpeas to a cast-iron pan and sauté with cumin, garlic powder, chili powder, and salt for about five minutes, stirring often. Mix the sauce together and divide into four individual containers. When you’re ready to eat, warm up the bowl, add the sauce, and enjoy!